We had an unexpected moment in the mission field. We knocked on a door and a lady said something to us we had never heard, "Come in." Now remember, I was a German missionary. This never happened to us; not even the members would say that to us. At this point suddenly this dear lady invited us in. My companion said, "Do you know who we are?" "You want to talk about religion, don't you?" she said. "Yes, we do" explained my companion. "Oh, come in. I've been watching you walk around the neighborhood. I'm so excited to have you here. Please come into my study." We went in and seated ourselves and she sat down behind the desk. She looked at us with a smile, then pointed to three PHD's hanging over her head. One in Theology, the study of religion, one in Philosophy, the study of ideas, and one in European History specializing in Christianity. She then kind of rubbed her hands together and said, "Do you see this row of books here?" We looked at a well arranged row of books. She then said, "I wrote them all. I'm the Theology professor at the University of Munich. I've been doing this for 41 years. I love to talk about religion. What would you like to discuss?" My inspired companion said we'd like to talk about the Book of Mormon. She said, "I don't know anything about the Book of Mormon." He said, "I know." Twenty minutes later we walked out of the room. We had handed her a Book of Mormon and this trade off that we had been on was over. I didn't see this lady again for another eight and a half weeks. It was in a small room filled with people (when I saw her again), as she was standing in the front dressed in white. This Theology professor at the University of Munich was well known throughout Southern Germany. She stood up in front of this small congregation of people and said, "Before I'm baptized I'd like to tell you my feelings. In Amos chapter 8:11 it says there will be a famine of the work of God. I've been in that famine for 76 years. Why do you think I have three PHD's? I've been hungering for truth and have been unable to find it. Then eight and one-half weeks ago, two boys walked into my home. I want you to know these boys are very nice and wonderful young men, but they didn't convert me. They couldn't; they don't know enough." And then she smiled and said, "but since the day they walked in my door I have read the Book of Mormon, the Doctrine and Covenants, the Pearl of Great Price, all of Talmage's great writings, Evidence and Reconciliations by John A. Widtsoe and 22 other volumes of church doctrine." She then said something which I think is a challenge for every one of us here. She said, "I don't think you members know what you have." Then in her quiet, powerful way, she said, "After those years of studying philosophy, I picked up the D&C and read a few little verses that answered some of the greatest questions of Aristotle and Socrates! When I read those verses, I wept for four hours." Then she said again, "I don't think you members know what you have. Don't you understand the world is in a famine? Don't you know we are starving for what you have? I am like a starving person being led to a feast. And over these eight and one-half weeks I have been able to feast in a way I have never known possible." Her powerful message and her challenging question was then ended with her favorite scripture, "For you don't see the truth can make you free." She said, "these missionaries don't just carry membership in the church in their hands, they carry within their hand the power to make the atonement of Jesus Christ full force in my life. Today I'm going into the water and I'm going to make a covenant with Christ for the first time with proper authority. I've wanted to do this all my life." None of us will forget the day that she was baptized. When she got finished being baptized, she got back out and before she received the Holy Ghost, she stood and said, "Now I would like to talk about the Holy Ghost for awhile." She then gave us a wonderful talk about the gift of the Holy Ghost. Two young missionaries, both relatively new, (one had been out about five months, the other three weeks) accidentally knocked on the door of the seminary in Reagansburg. 125 wonderful men were studying to become priests inside. They didn't realize this was the door they had knocked on because it looked like any other door. They were invited in. In somewhat of a panic, the man said, "I am sorry we just don't have time right now." The two missionaries were relieved, but then he said, "Would you come back next Tuesday and spend two hours addressing all 125 of us and answer questions about your church?" They agreed that they would, and ran down the road screaming. They made a phone call to the mission president and cried for help. The mission president called us and said, "Do you think that dear lady that you have just brought in to the church would like to come help these two missionaries with this assignment?" I called her to explain what was to happen, and she said, "more than I would like to eat, more than I would like to sleep, more than..." I said, "Fine, you don't have to explain." We drove her to the seminary and as we went in, she grabbed the two missionaries that had originally been invited, put her arms around them and said, "you are wonderful, young men. Would each of you spend about two minutes bearing your testimony and then sit down and be quiet please?" They were grateful for their assignment. They bore their testimony and then seated themselves. Then she got up and said, "For the next 30 minutes I would like to talk to you about historical apostasy." She knew every date and fact. She had a PHD in this. She talked about everything that had been taken away from the great teachings the Savior had given, mostly organizational, in the first part of her talk. Then the next 45 minutes was doctrinal. She gave every point of doctrinal changes, when it happened and what had changed. By the time she was done, she looked at them and said, "In 1820 a boy walked into a grove of trees. He had been in a famine just like I have been. He knelt to pray, because he was hungry just like I have been. He saw God the Father and His Son. I know that is hard for you to believe that they could be two separate beings, but I know they are." She shared scriptures that showed that they were and then said, "I would like to talk about historical restoration of truth." She then, point by point, date by date, from the Doctrine and Covenants put back the organizational structure of Christ's church. The last 20 minutes of her talk were absolutely brilliant. She doctrinally put the truth back in place, point by point, principle by principle. When she finished this profound talk, she said, "I have been in a famine as talked about in Amos. You know that because last year I was here teaching you." 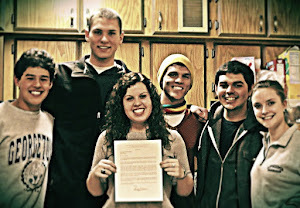 For the first time, we realized that she was their Theology professor. She continued by saying, "Last year when I was teaching you, I told you that I was still in a famine. I have been led to a feast. I invite you to come." She finished with her testimony and sat down. What happened next was hard for me to understand. These 125 sincere, wonderful men stood and for the next 7 minutes, gave a standing ovation. By the time four minutes had gone by I was crying. I remember standing and looking into their eyes and seeing the tears in their eyes too. I wondered why they were applauding after the message she had given. I asked many of them later. They said,"to hear someone so unashamed of the truth, to hear someone teaching with such power, to hear someone who finally has conviction." The two greatest questions in life, pertaining to the identity of God and our personal identities, can be answered through a variety of means. It is our choice to use societal definitions or unchanging doctrine to find our answer. When Joseph Smith prays in the Sacred Grove, he first learns of the nature of God. God knew Joseph’s name. Our God is a personal being. He created us and he knows us more than anyone we will ever know. And God spake unto Moses, saying: Behold, I am the Lord God Almighty, and Endless is my name; for I am without beginning of days or end of years; and is not this endless? And, behold, thou art my son; wherefore look, and I will show thee the workmanship of mine hands; but not all, for my works are without end, and also my words, for they never cease. We are created by God, in his image and in the similitude of Jesus Christ. We are loved by an infinite God with an infinite love. We each have an infinite potential and we are of infinite worth to our Father in Heaven. There are social mirrors placed all around us based on the societal norms, norms which are more irregular and shifting that their name implies. When we look into these mirrors, we can view loose and deceiving definitions of the identity of God and our own identities. By subscribing to these ideologies, we can fail to understand the proper morals by which we should abide. I am thankful for the scriptures and the truth they hold. Their words create a perfect mirror in which we can look and find direction. Society distorts truth; the scriptures keep truth untainted from the influences of the Adversary. God is Good. He is infinite. He loves me perfectly and can see a potential that I often fail to understand. God loved me and I know this because he sent Jesus Christ to die for me. He did the same for you, too. God, the perfect parent, watched the Son suffer, bleed from every pore, and lose his life. God is great. "Truth shall spring out of the bearth; and righteousness shall look down from heaven. Yea, the Lord shall give that which is good; and our land shall yield her increase. Righteousness shall go before him; and shall set us in the way of his steps." I thought it would be important to lay down how a Mormon mission works. As of October 2012, the age requirements for missionaries have been altered. Now, men can serve two-year missions beginning at age 18 and women may serve eighteen month missions beginning at age 19. These ages are minimums and many missionaries will not begin to serve until they are a little bit older. 1. In May, I will come back to Provo and enter the Missionary Training Center. There are MTCs all over the world, even one in the Philippines, but that one is exclusively for Filipinos. I will be in the MTC for about a month and a half where I will learn how to teach about the Church as well as the Tagalog language. 2. From the MTC, I will leave with other missionaries and fly to the Philippines. When I get to the Philippines, I will travel to Laoag where I will be assigned another sister missionary. Her role will be to train me. During my entire mission, I will be partnered with another sister missionary. 3. What will I be doing with my time? My role as a missionary is to share the Gospel with everyone I can in attempt of bringing them to Christ. Also, serving the communities around me will take up a lot of my time. During my mission, I will serve in different areas in the Philippines. My mission president will assign me and other missionaries to different areas with different companion missionaries. My mission boundaries extend through the north of the Philippines and I expect to live in many different places. Missionaries live by extremely high standards. In the heat and humidity of the Philippines, I will be expected to look my best and be a representative of Jesus Christ. This means no dating, no Facebook, no personal cell phone, and only one day a week to take care of personal needs like shopping and laundry. I have heard so many missionaries describe the time they spent as a missionary as "not the best years of my life, but the most important years for my life." I am a little scared but a lot more excited to see what the Lord has in store for me in Laoag. The adversary has never been as active in my life as he is right now. Since I started my papers, even before I started them, he woke up and started following me around. Last semester I made the decision that I would complete my papers over Christmas vacation in Tennessee. When I got home to Nashville, I found out that my Stake President was leaving the country in a week. My records which should have arrived back in Tennessee had not yet left my Provo ward and everything was moving too slowly. The three and a half days I took to start and submit my papers was intense. Two doctors’ appointments, a few visits to the dentist, and three interviews made for a hectic 84 hours. It was stressful then and it has been stressful since getting my call. I am a student, I have a job, I am leaving for a week-long academic competition in a month, but above it all, I am preparing for the most important eighteen months of my life. I know that it is going to get a lot harder. I haven’t even begun to serve my mission; I only preparing for the battles I am going to fight. I know that the Lord is guiding me. He is setting my path and with patience I will follow him and grow spiritually. I am a tool in the hands of my Maker. He is training me so that when he decides to use me, I can perform to the best of my ability. The Church is true. Jesus Christ lives. God is great. There are a lot of scary things about going on a mission. Right now I am praying that I will be able to get my passport and visa on time and I hope that my scripture study is sufficiently preparing me to teach the Gospel to others. Regardless of all the things I have to learn and do now, I feel a great peace from the assistance of the Lord at this time. I cannot admit that I always wanted to go on mission. I should probably repent for all of the comments I have made in my past life that included the words “sister missionaries,” “dowdy," and “single.” Over the last year, as my heart has softened towards sister missionary work, I have felt a personal call to serve a mission. President Monson’s announcement that lowered the required ages of Elders and Sisters was simply an answer to my prayers. When I received my call last month, this answer became an undeniable confirmation of my duty to serve the Lord in Asia. There is a rush of excitement that flooded BYU in October and it has not seemed to leave. As my friends open their calls each week, I feel a greater joy for the work we are able to accomplish. As the Army of Helaman and as Sisters in Zion, we will bring the world His truth.